Signature :Mumei(unsidned) attributed as Echizen Rai. This Echizen Rai. belongs to Jyojyo saku ranking. Blade length : ７１.６　cm or 28.2 inches. Sori : １.２ cm or 0.47 inches. Width at the hamachi :３.３８ cm or 1.33inches. 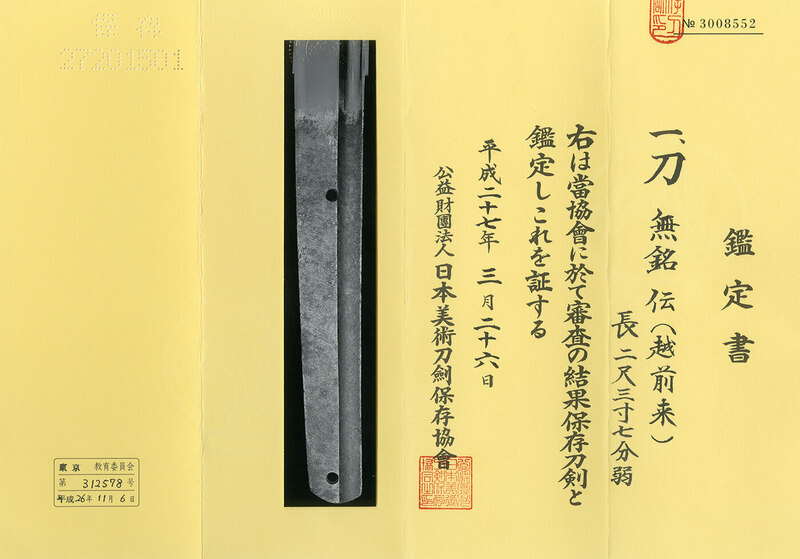 Width at the Kissaki : ２.５１ cm or 0.99 inches. Kasane : ０.５２cm or 0.2 inches. Era : Late Nanbokucyo period. Shape : Wide and thick, Osuriage, Wide Bohi engraved on both sides, shallow Sori, long Kissaki. Jitetsu : The mixture of Koitame-hada and Masame-hada, Jinie attached, Utsuri appears slightly. Hamon : Nie-deki, Suguha. Gunome-midare around Monouchi on the other side. Deep Nioikuchi and Soft Yo, pointed Boshi. Special Feature : The sword looks like by Rai Kuninaga, but NBTHK attributes this sword to Echizen Rai. Originally this sword might be wider. From Aoi Art : The sword is influenced by Rai school. It looks very clear and this Gunome-midare hamon is really interesting, Unfortunately, however, there’re Kitae on blade and on Boshi, but considering the age of the sword, condition is fine. Aoi Art estimation paper : whole Oshigata.Aoi Art estimation NBTHK Hozon paper : whole Oshigata.